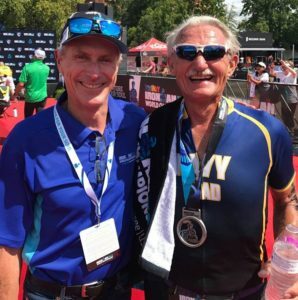 Brad is our oldest Ambassador and began racing In 1992 and has now done over 160 triathlons including 8 full Ironman races and over 60 Kinetic Multisports events. 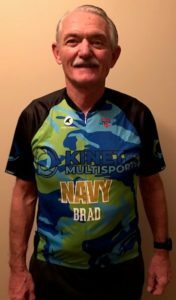 Brad was a Naval Aviator flying the A-6 Intruder on active duty and the Commanding Officer of VP-68 flying P-3’s in the Reserves. He was also a computer executive for several companies. Brad is easy to spot, he’s the old guy in a Navy shirt. He is retired now and lives full time at Lake Anna.